Rob Andrew made his international debut for England in 1985 against Romania, and following a winning start he went on to rack up 71 caps at fly-half. Criticised for his conservative kicking game in certain quarters Andrew was nevertheless part of a very successful England side, winning three Grand Slams and starting in their losing effort in the Rugby World Cup final in 1991. Andrew also played in the 1987 and 1995 Rugby World Cups, scoring a memorable drop goal in the latter tournament to defeat Australia in the quarter-finals. Andrew's playing career was ended by injury in 1999, at which time he was acting as director of rugby and playing for Newcastle. He continued as director of rugby until 2006, when he joined the Rugby Football Union as England's director of elite rugby by the RFU. 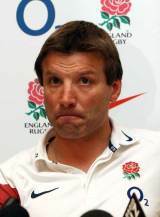 Andrew presided over the appointment and dismissal of Brian Ashton as head coach and recommended he be retained in 2008 only to see Martin Johnson handed England's top job. Andrew took temporary charge of England for that year's troubled tour to New Zealand with Johnson opting to stay home with his pregnant wife. The team were hammered in a two-Test series while certain members of the squad were embroiled in alleged sexual assault. Andrew helped strike a deal between the RFU with the Premiership clubs to ensure greater access to England players, but he paid the price for poor results on the pitch during his tenure when his role was scrapped following a review by new RFU chief John Steele in January 2011. He was later appointed director of rugby operations but his future was soon called into question again following Steele's exit from the RFU and a disastrous Rugby World Cup campaign that saw England hit the headlines for all the wrong reasons. Johnson resigned from his post but Andrew refused to follow him in the face of growing criticism. He famously declared that the RFU had hit "rock-bottom" after confidential reports, which were critical of some members of the World Cup coaching and playing staff, were leaked to The Times. As the RFU looked to steady their operation following the exit of acting cheif executive Martyn Thomas, Andrew was confirmed as the RFU's professional rugby director at the end of 2011, with no responsibility for senior England team.